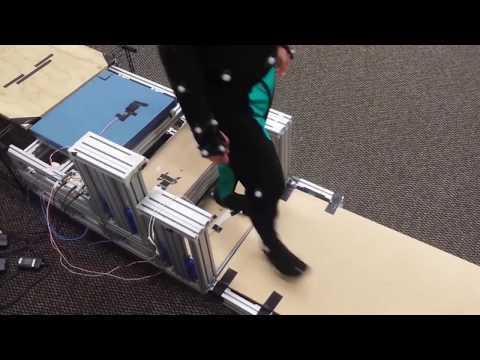 Researchers at Georgia Tech and Emory University have created a device that makes walking up and down stairs easier. They’ve built energy-recycling stairs that store a user’s energy during descent and return energy to the user during ascent. The spring-loaded stairs compress when someone comes down the stairs, saving energy otherwise dissipated through impact and braking forces at the ankle by 26 percent. When going up, the stairs give people a boost by releasing the stored energy, making it 37 percent easier on the knee than using conventional stairs. The low-power device can be placed on existing staircases and doesn’t have to be permanently installed. Each stair is tethered by springs and equipped with pressure sensors. When a person walks downstairs, each step slowly sinks until it locks into place and is level with the next step, storing energy generated by the user. It stays that way until someone walks upstairs. When a person ascending the stairs steps on the sensor on the next tread up, the latch on the lower step releases. The stored energy in the spring is also released, lifting up the back leg. The paper is currently published in the journal Public Library of Science PLOS ONE. The authors say the initial idea was to use energy-recycling prosthetic shoes to help people going up stairs. Liu is a co-author of the paper with colleague Lena Ting, a professor of biomedical engineering in the Wallace H. Coulter Department of Biomedical Engineering at Emory and Georgia Tech. Walking down stairs is like tapping the breaks of your car while revving the engine," said Ting. "Your legs use a lot of energy bracing each steop to avoid falling too fast. Our stairs store that energy rather than wasting it." The researchers didn’t expect, prior to designing the device, that the stairs would actually ease the impact of going downstairs. Liu initially got the idea for the project when she attended a conference and saw an ankle brace that stored and released energy. Her 72-year-old mother has no problems walking but has difficulty climbing steps, and Liu knew she wouldn’t wear special sneakers just for stairs. So she decided to make smart stairs that act like the shoe. “Maintaining mobility is very much a use-it-or-lose-it thing. It’s important to keep people walking and independent through injury and aging to maximize quality of life,” said Ting. The researchers think the temporary stairs could also be helpful for those recovering from surgery or pregnant women — people who only need help for short periods of time and don’t need to permanently alter their homes. The researchers are looking for partners to extend the project, which currently runs on a staircase with only two steps and can be used by just one person at a time. It was supported by the National Science Foundation (EFRI-1137229). The paper, "Stair negotiation made easier using novel interactive energy-recycling assistive stairs," was published on July 12. Any opinions, findings and conclusions or recommendations expressed in this material are those of the authors and do not necessarily reflect the views of the National Science Foundation.